I just sent my final copy of The Witch back to the publisher to get uploaded to DriveThruRPG soon. I honestly can't wait to get this out to you all. It seems like I have been working on it forever. I started this blog in fact as a design blog to talk about the development of Eldritch Witchery and The Witch. A number of the monsters, magic items and spells that appear in the book I have posted here. My desire to do this book for "Basic Era" games was partially due to my involvment in the old-school game movement, but also because I had been going back to my copy of Moldvay's Basic Book and some of his ideas on what a witch should be. 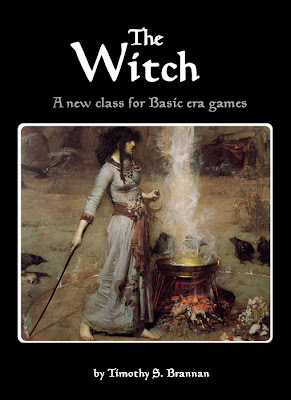 I also wanted this book to capture what I felt were some of the best books on witches from the early days of the game. Make the book feel like something I would have wanted to buy in 1982/83. Make the witch more than just another type of magic-user, but still allow her to be easily added to a game. Keep what was best of the old school, but still keep in mind all the developments of the last 30 years. Elmore art. I might get grief for this, but ever since Dragon #114 came out I wanted a witch book with art from Larry Elmore in it. I am in a position to do that now. It's not the entire book, but there are some choice pieces in the 120 pages. So what do you get in The Witch? Well I was reading that selling points that do nothing but list a bunch of numbers turn people off. On the other hand I have had some people ask me what they are getting. Rules for Covens, Covensteads and example covens. All with years of playtesting. I am hoping to get a preview up for you all here soon.